As this new investment vehicle garners increasing interest, we wanted to enable you and your firms to seize these opportunities. In response to client feedback, we are pleased to announce the introduction of a new data element and searchable field: Traffic Count. Traffic Count leverages Federal and State agency data on daily automobile trips by address. The Yardi® Matrix Mobile app now provides access to our commercial and self-storage asset classes, in addition to multifamily. Quickly pull up properties in your immediate area while you're out of the office. Access rich property information, as well as our database of true property owners (not LLCs) and managers. Jeff Adler, VP of Yardi Matrix talks about the future of Multifamily in a GlobeSt.com interview. Jeff Adler, Vice President at Yardi and leader of the Yardi Matrix team, weighs on his top six markets, the future of the multifamily industry, how the commercial real estate industry is using Yardi Matrix, and much more. Tom Flexner: We’re in a world of 2 to 3 percent GDP growth globally – with many factors ranging from demographics to commodity prices to excessive leverage levels to regulatory drags to geopolitics to a pervading sense of uncertainty and ambiguity — all conspiring to tamp down economic activity. Typical economic indicators like employment, inflation, and investment remain favorable for the apartment sector, and, even though demand for housing remains high in many markets, permitting and completions ticked down in 2018. From evaluating the opportunities and challenges of using big data to mitigation strategies, listen in to this power panel as they discuss risk influence factors and how these issues impact their thinking on 2019 development strategies. Jeff Adler presented the Yardi Matrix house view of the self storage industry at the SSA Fall Conference in Las Vegas on September 6, 2018. He focused on the economic and demographic drivers of the self storage industry, as well as current and projected supply and demand fundamentals. Yardi Matrix released its most recent metro level supply forecast at the Jefferies Self Storage Data and Development Summit. David Dent presented our insights on supply growth at the national level as well as key metro areas that have attracted significant self storage interest in recent years. Our forecasts detail expected completions in 2018 and 2019 at the metro level, and provide detailed analysis regarding the current stage of the self storage real estate cycle. We also covered market level rent growth analysis for a variety of self storage unit types. Jeff Adler, Vice President of Yardi Matrix, spoke at the Inside Self-Storage World Expo in Las Vegas on April 4, 2018 where he detailed the latest trends in transaction volume and pricing, metro rent performance and forecasts of new supply by metro compared with existing inventory. Jeff Adler also presented new research focused on fundamental new supply and demand conditions in New York, Florida and Texas. 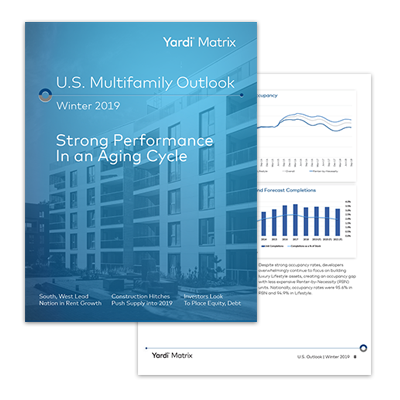 Jeff Adler, Vice President of Yardi Matrix, recently presented his research at the IMN Middle-Market Multifamily Forum for small and mid-sized apartment owners and developers. Jeff focused on the historic relationship between prices and the economic cycle and what the future may hold for multifamily real estate. Check out the latest insights from Jeff Adler and Yardi Matrix as we approach the end of 2017. 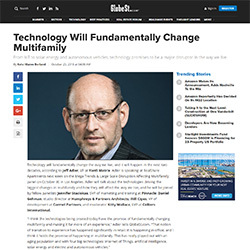 Jeff shares his views on the state of the economy, the multifamily market, and the future impacts of innovative technology on real estate. Check out the latest insights from Jeff Adler and Yardi Matrix as we approach the end of 2017. Jeff shares his views on the state of the economy, the office market, and the future impacts of innovative technology on real estate.